When I first decided to move my website from a free hosting to a paid one, I got lost in the jungle of hosting providers out there. I mean there are so many of them so how do you choose? All the providers say they are the best, all say they offer 99.9% uptime ( some badass daredevil providers also guarantee of 100%) all say they are the cheapest in the town (while offering everything important in different add-on packs). So how were I suppose to choose? I was a new blogger so I couldn't spend lots of my money just on hosting, meanwhile, I needed my site to grow so I couldn't afford a bad service. So I decided to make a list. I wrote down all the possible options for me, then I started to cross off all the names which were not reliable or which had many bad reviews. 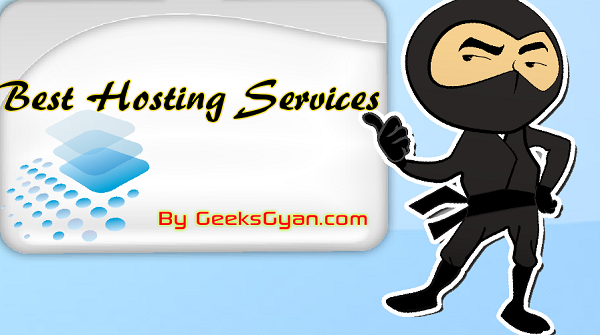 Finally, I shortlisted 10 of the best hosting providers and then I chose it according to my budget. Then I realised that every day thousands of other young bloggers also suffer from the same crisis as I did. So I decided to publish the list I shortlisted. All of them are reliable and you can choose any of them as your needs. What better then a hosting provider that saves your money? You get a free domain name with every hosting plan. Along with it you get unlimited email accounts for your domain name. They have a one click WordPress install too, means you can get your site live within 10 minutes. They also offer 24/7 live support for their customers. Quick setup means you can get yours have your account activated within minutes. They have an easy to use Control Panel for first timers. A free site builder means you don't need any coding knowledge to build your website. And bonus - you get $200 in Facebook, Google, and Bing advertising credits. Enough reasons to buy their web hosting already. You get a free domain name with lots of database options. They also have one-click WordPress install. And support for E-commerce websites. As a unique feature they offer a Zero - downtime website transfer. Means you transfer your site from any other hosting without facing any downtime. They also offer a 60 days money back guarantee means they are confident on there service. And yeah you can get a 50% discount with BESTWPHOST2015 coupon. As they say "hosting for all the fat cows". If you are looking to host a large or well-established website then they can do it for you. Other features include a FREE domain name, Included point-and-click website builders, 24/7 support, Unlimited disk space, bandwidth, emails, and databases. All great websites are started with an idea. And they all need a great Web hosting who respects the power of an idea. And that's what they promise to give. They offer Unlimited storage, plus 1GB of cloud storage, FREE $200-worth of advertising credits with Google and Bing and many other features. They are running from 1998, and they are still running, I think that's all you should know to trust them. In an era where companies don't even survive a single year, they have managed to stay live for so many years, means they are really trustable. Their features include Featuring easy setup and superb reliability since 1998, FREE domain and FREE Google marketing included, also Unlimited disk, bandwidth, and emails come in a cheap 2.99$ monthly package. I still host many of my websites on HostGator. They are fast, reliable and cheap. They also have different hosting plans for different countries means you can expect things to be easy for you. They do not offer a free domain name like many others, but believe me you won't regret it. However I don't have any experience with hosting a larger size website with them so I can't advice you on that matter. They are the official recommend hosting for any WordPress blog. Is there anything more you need to know? WordPress is the biggest blogging platform in the world and if they say there is someone recommend for hosting, you can't neglect them. So no matter what ever list you make about hosting providers, they got to be in it. Customers are at the top and doesn't matter what the experts say if customers don't find your product satisfying then it doesn't matter. And this is the people's choice. You don't have to believe me, go try to find a bad review about them and compare it with any other hosting provider and you'll find the difference.